Fellowship Groups meet every 2nd Sunday of the month in various homes in Bossier City and Shreveport. The basic format for our time together is a meal, prayer, singing, study and fellowship. The purpose of Fellowship Groups is to cultivate spiritual growth through gospel-centered edification. "Nearly all Christians would affirm the centrality of prayer for a healthy Christian life. And yet, for many, prayer is often a challenge, requiring intense personal commitment and self-discipline. 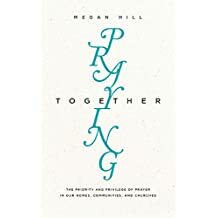 However, as Megan Hill points out in Praying Together, our normal approach to prayer leaves out a crucial component: other people. While personal prayer is important, God designed the church to be a community of believers who regularly pray together. Exploring the Bible’s rich teaching on what it means to gather at God’s throne with one voice, Hill lays a theological foundation for corporate prayer and offers practical guidance for making it a reality—in our families, churches, and communities."